Included in the price - great!! Very good breakfast for those who want to enjoy the outdoors until lunch. Fried egg, boiled egg, bacon, cereals, yoghurt, cheese, meats and patés, very well prepared and tasteful. Good and strong coffee. The only disappointment is the juice, watery apple and orange juice, or it may hardly be called juice as it is far away from fresh fruit that I have tasted. 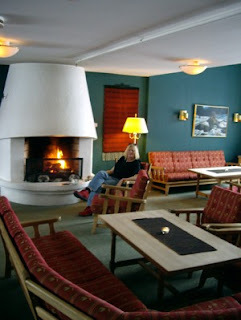 Very nice reception area where you may sit by a fireplace after you have returned from your skiing adventure. The bar is nice, but the design is slightly outdated. The same could be said of the dining room, but you can enjoy the greatest view from your table - and that helps! There is a swimmingpool with a sauna, but it is small and could do with some renovation. We paid NOK 2500,- (€ 300) all inclusive for two nights, included breakfast, one dinner and two lunches. A decent price, but I would not have paid the price for this standard, if I had a choice.